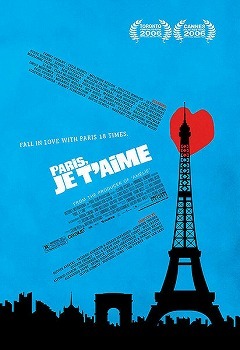 Paris, Je t'Aime is an amazing film. It's premise sounds confusing, and it very easily could be. It could also very easily get annoying with having to change stories every few minutes, but the stories flow into each other. The film starts out with stories of first meeting. Then it flows into stories of being together for a while. There's some stories of tragedy, and coming apart, and the final story is about being alone, but it's the perfect note at the end of the film. The individual films, go through all different kinds of love as well, from first loves, to familial love, to the love you have after 30 years of marriage, even the love you still hold for a person during a divorce. There's tragic love as well. And simply falling in love with Paris. It's amazing because there are so many people working on this film, generally a minimum of 3 per segment, with the exception of one, and none of them overlap. The cast list reads like a who's-who, and the list of Directors (usually one, maybe 2 people), 19 people long (Joel and Ethan Coen directed a segment), is even more prestigious. Alfonso Cuarón, Olivier Assayas, Wes Craven, Gus Van Sant, Tom Tykwer, Walter Salles, and others, it's kinda crazy. With all the people involved, you'd think it would get confusing, but it's a beautiful movie, wonderfully done.